Over the Rainbow: Kissing booth love! Two (?) months ago, I missed out on the Studio Calico add-on that everyone was chasing after, so I ended up with my other choice--the pretty Kissing Booth add-on. Which should have been a natural winner for me, being a lover-of-all-things girly and a new girl mama! And here's what I did with it! I had so much fun with the soft, romantic colors in this kit. The doilies are added in from my stash because what girly layout is complete without doilies? I wrote about how lucky I felt to be pregnant with a healthy baby, even with the stresses of the last few weeks of the pregnancy. I love that this is the last layout I created before my little one was born. My second layout uses a sweet photo from one of my best friends and her little baby (photography by Sheena Dishaw-Levi). I had fun with the gray and red/pink color combination! I thought this page really called for some sewing, but sadly my sewing machine is currently broken. And in terms of getting fixed, it's waiting in line behind the printer, diaper pail, shower clock, and necklace rack....so it may be a while. Sigh. And a sneak--I got this butterfly in the packaging from an etsy store and have been saving it for a project ever since! So there you have it! What's your favorite kit or product line that YOU've been playing with lately? Wow. Your luckiest layout is just stunning, Keshet! you will be doing alot of hearts in the future.... looking forward to them all. just gorgeous!!!! I am loving dear lizzy and echo park right now! 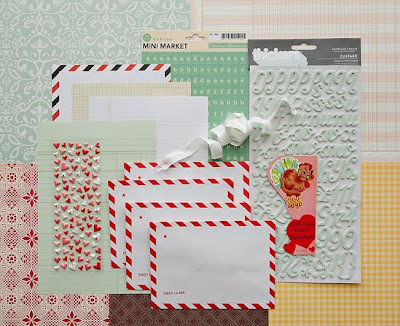 Beautiful work~love how you used the red stripped envelope and the journaling really stands out!! Love it all!!! The colors on these are beautiful. beautiful pages keshet! so sorry about your sewing machine! Beautiful work Keshet! Love the little pops of red! And I can't answer your question as I haven't played with paper in over a year. I need to start soon!! Both layouts are great. I love your title treatment on the first one (big alphas + mini alphas + handwriting), and I love the plethora of hearts on the second. Love those layouts! Lately I've been quilting and haven't touched paper - but hoping to scrap tonight. I love these, especially the Luckiest. I have not had any motivation to scrap for WEEKS. With the exhaustion and nausea it has been impossible. I hope it kicks in soon because I am so behind! Great kit and stunning layouts! Enjoy these precious days with your little one. I really like the 'luckiest' layout! Just lovely. I have some Cheery Lynn Designs butterfly dies on order. I plan on selling my MS punch!